Elandon Roberts is in to start this series for #Patriots defense. Dion Lewis still getting work, in fact. As is Gronk. Lewis has already re-set his career high in touches he set last week. #Patriots LB Elandon Roberts has emerged from blue medical tent and is standing on sideline. Tom Brady is still in. Dion Lewis and Gronk are not to start this drive. Elandon Roberts is in the blue tent. Kyle Van Noy came in for him at middle LB. Elandon Roberts is shaken up. Gostkowski's 21-yarder extends #Patriots lead to 24-3. Le'Veon Bell watched that last Dion Lewis run and said "Man, look at that patience!" Bademosi going for an Oscar and a Lombardi. Travis Kelce is inactive. Gronk should have the edge on him in All Pro voting, I would think, but that's still a help for No. 87. Jim Nantz notes that he and Romo had an early morning call with Brady on Thursday morning, and "He got into a really deep discussion about personal growth this year. Faced a lot of tough challenges. He learned a lot." James Harrison has been in coverage today, uh, more than I would have expected. HALFTIME: Patriots lead Jets 21-3. Steelers lead Browns 21-14 and have the ball with 1:19 before the break. Brady to Lewis on the 5-yard TD pass and #Patriots take a 21-3 lead with 20 seconds left in first half. 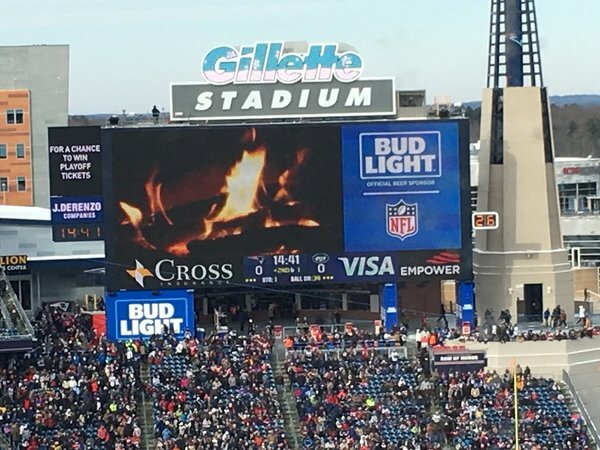 I used up almost all my winter puns on a Dion Lewis story from the game last week. And now he has 2 TDs again.